My dad told me that since my birthday week is over, I can’t write any more posts about it. So this post will have to be not about the event for which I threw this party, but rather about the party itself, which could’ve been for any old reason, really. It could’ve been an early Cinco de Mayo party, or a Mother’s Day party to which I didn’t invite my mother. Or even a “just because it’s grilling season” party. 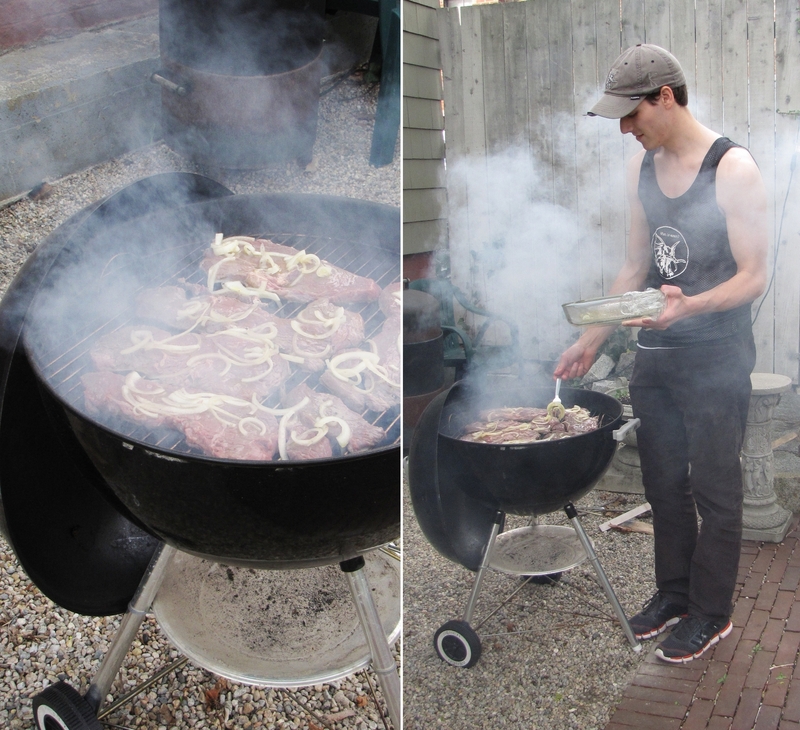 Anyway, last Saturday I threw a party at my house, and we ate and drank and it was very fun, and the food was very good, so I thought I’d share some recipes and pictures. The culinary theme was Mexican, so we had tequila-marinated steak tacos with pickled red onions and queso fresco, spicy chipotle cream dip, fried avocados, sangria, and margaritas. It was a beautiful Saturday night, so we sat outside in the garden, and my roommate hung up the outdoor lights that signify summer is coming, and Trevor grilled, and it was a great way to spend a night. Even though it did require most of Sunday to recover from the events that took place after the party, which included stops at a few more party locations, more than a few more drinks, a little dancing, and waking up at my friend’s Newbury St apartment on Sunday morning surrounded by marathoners. And let me tell you, waking up in last night’s clothes and stumbling out into a street filled with people gearing up to run 26 miles the next day does not make you feel like a successful person. But it was pretty funny. All in all, the evening was well worth the recovery. The steak tacos were definitely the gastronomic highlight of the evening (well, besides the tequila shots, but I can’t very well share a recipe for tequila shots). It’s a very simple recipe from Antojitos, which is one of my all-time favorite cookbooks (full review and more recipes here). 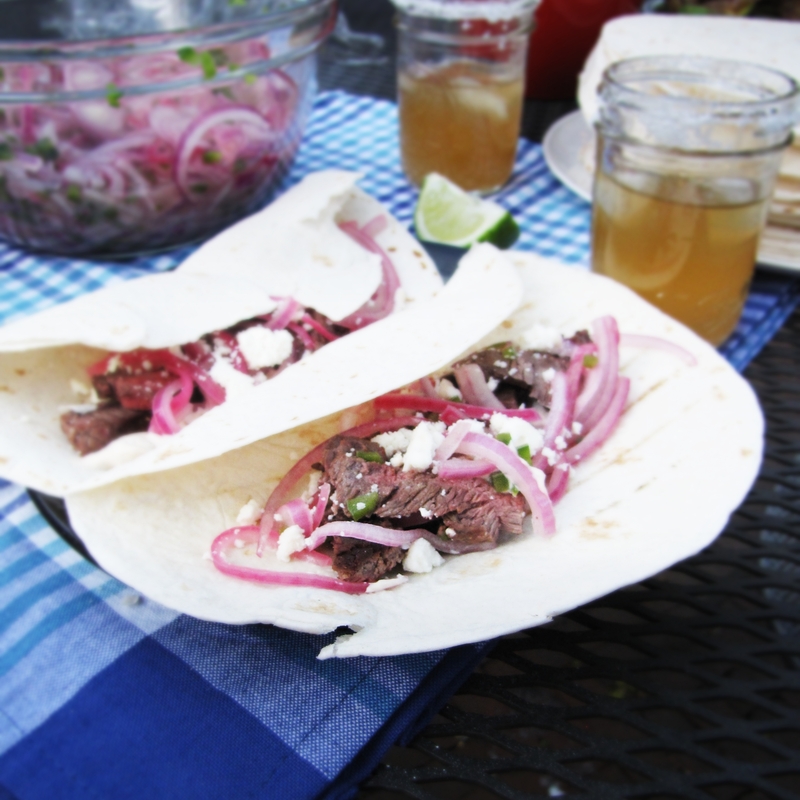 You just briefly marinate skirt steak in tequila, olive oil, lime juice, and onion, then grill until medium, rest, slice, and serve with your favorite taco fixings. The marinade and grilling results in a very tender and flavorful steak for such an inexpensive cut of beef. 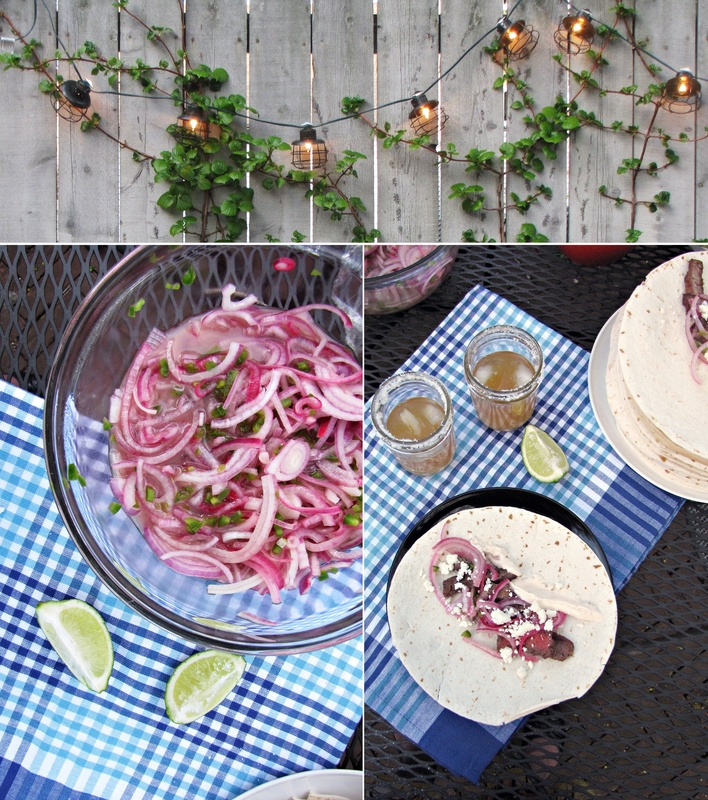 We served them with guacamole, queso fresco, chipotle crema, and pickled red onions, and they were delish. Grilling season! Summertime! Get excited for it. Recipe from Antojitos. Serves 6. Rinse the steak under cool water and pat dry with a paper towel. In a large glass baking dish, mix olive oil, onion slices, tequila, lime juice, sugar, salt, and black pepper until thoroughly combined. Lay steak in marinade, cover with plastic wrap, and refrigerate for 30 minutes (do not leave it for any longer than 30 minutes or it will get tough!) Prepare your grill. Lift steaks from marinade and place on grill. Grill for 2-3 minutes on each side, until outside is seared and inside is medium. (Read about the finger test for determining the doneness of meat here!) Transfer the steak to a cutting board and let rest for 10 minutes, then slice against the grain into 1/2 inch wide strips. 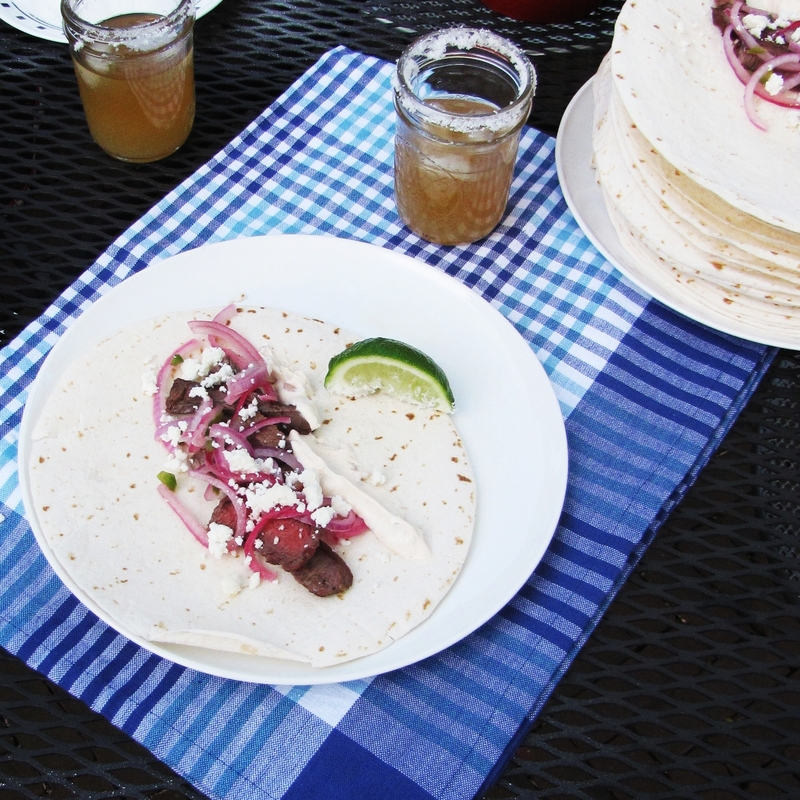 Serve steak on tortillas and top with red onions, chipotle cream, avocados, and queso fresco. Eat hot! Recipe adapted from Antojitos. Serves 6. Stir together onion, lime juice, chilies, and salt. Cover the bowl and refrigerate for 3-5 hours, stirring once or twice, until onions have begun to turn bright pink and have softened somewhat. Store in a glass jar in the fridge for up to 1 week. (Flavor will continue to develop over the course of the week). Wow! I needed a post like this to help me get over the gloominess that we’ve had today. Those steak tacos sound delicious! YUM!! I can never eat enough tacos! Those look so good!